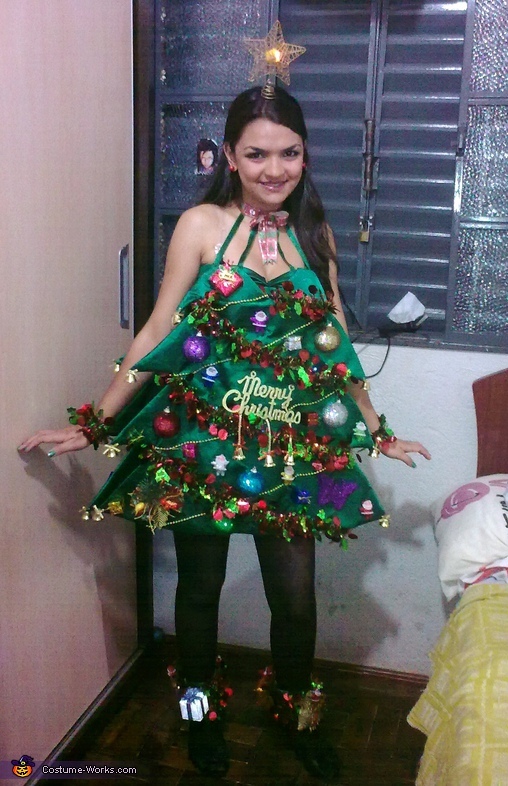 Well, this one I took the idea from Katy Perry Christmas Tree costume, that she dressed in a show in 2008 at Jingle Ball. I wanted it to look like a dress but at the same time like a real Christmas tree, then I drew something that started in my head (where I put the star) and finished in feet (where I put some little gifts). The result is what you see in the pictures. I used satin all over the dress, the tree I used buckram to make it hard and make it look like a tree. I'm wearing a dress and the tree is glued on the dress by velcro, so I can put it and take it when I want. The decoration I bought and I pasted using hot glue. I also used led lights to make it shine and blink like a real Christmas tree. You can see it in action in the video below. Jade, I LOVE your costume! I have a Christmas date party coming up at the end of Novemeber and I was wondering if maybe I could either buy this dress from you or you send me how you made it so I can go ahead and start crafting and attempt to make something similar? Thank you so much! I don't know if I can translate it well. I used some kind of hard stuff behind the fabric, you can glue it together using a iron. You probably will find it in a fabric store. It's simple. After that, I sewed the hard parts in a dress. You can see it in the video. This is the coolest costume I have ever seen! I want one for myself.